Strong harvest brings in 60M pounds of potatoes - Kitchen Farms, Inc.
ALBA — “We’re farmers for two months of the year and businessmen the other 10,” said Bill Kitchen, president of Kitchen Farms. 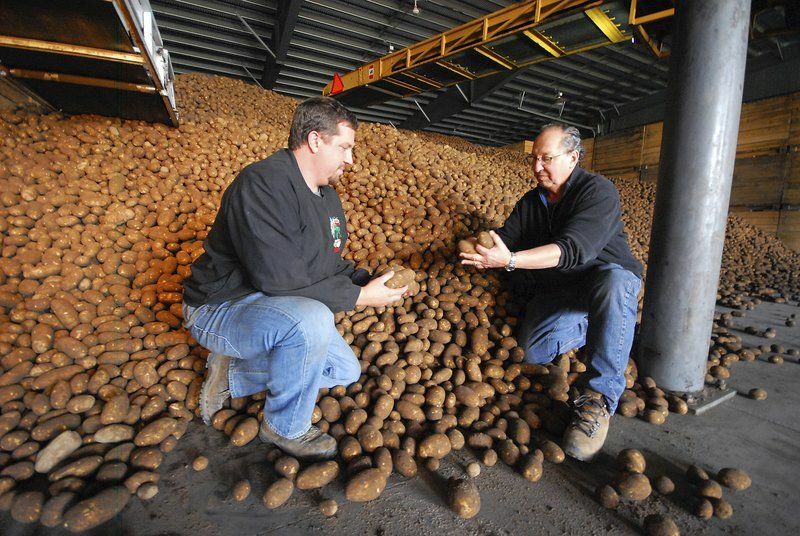 The potato operation, nestled between Mancelona and Boyne Falls, is a true family success story. Bill, 70, started working on the family farm at age 17. His son, Don, 37, is vice president. Don suspects his sons, ages 10 and 12, someday probably will work in the family business. When they’re not planting and harvesting, the two businessmen personally deal with the mechanics of the business: sales, personnel, taxes, machinery, maintenance, transportation, chemistry, seed, irrigation. The father-and-son team emanate a relaxed and caring attitude that extends beyond the confines of their own farm. “We don’t have competition. We have friends and neighbors,” Bill said in response to a question about competition from other potato farms. The business began 104 years ago as a small family farm, founded by Bill’s grandfather. By 1961, Kitchen Farms controlled 900 acres, Bill said. It now occupies about 5,000 acres, though the amount of land planted in potatoes each year varies with a crop rotation schedule. Acreage not actively producing potatoes is protected from erosion by a carpet of grass. This year, 1,240 active acres produced about 60 million pounds of potatoes. All those spuds move from the field to Kitchen Farms’ nearby storage facility in a fleet of military surplus trucks. Each truck carries between 28,000 and 30,000 pounds. Most of that product is stored in wooden boxes, stacked in a series of cavernous warehouses like mysterious artifacts in an Indiana Jones movie. Warehouse temperature is strictly controlled to keep the potatoes as crisp and fresh as possible. After they’re packed tight with spuds during harvest season, the giant spaces are gradually reduced to a temperature of 36 degrees as humidity is simultaneously increased to 98 percent for the long haul through the winter season. “It’ll be almost raining in here,” Bill said as he toured the facility. Just as storage conditions are a balancing act, so, too, is much of the farming operation. Kitchen Farms grows mostly russet, white and yellow potatoes, but the exact source — as far away as Maine and Idaho — and variety of seed changes incrementally as seasons pass and growing conditions change. Staffing levels vary with the demands of the season’s work, from a year-round base of 15 employees to a high of 40 workers between September and July. Once the harvest is safely packed away in the warehouses each fall, processing and shipping season begin. Bill, who says he has a mechanical knack but no formal training in the field, personally designed every piece of the network of conveyors and workstations that fill one end of a building where the spuds are sorted, washed and bagged. Another massive conveyor system of his design now is being fabricated in the farm’s machine shop. But all the technology is useful only if the potatoes are in good condition. A premium product sprouts from tightly controlled growing conditions. Kitchen Farms’ network of sprawling pivot sprinklers is a familiar sight to anyone who frequents the highway between Kalkaska and points north. Moisture level is critical throughout the potato cycle, and the pivots help keep the dirt moist during dry periods. This growing season turned out well for Kitchen Farms. Kitchen Farms is the largest potato farm in Michigan that ships only fresh potatoes, Bill said. The state’s larger operations process a portion of their raw product before shipping it out. All potatoes grown at Kitchen Farms, Bill said, go through retailers for sale as fresh; they’re not used to make potato chips or other processed products.